Now Foods NAC is a dietary supplement with 1000 mg of NAC (N-acetylcysteine) which delivers the right form of cysteine and stimulates the production of glutathione - the guard of human health. N-acetylcysteine (NAC) - a bioactive and safe n-acetyl derivative of cysteine. It increases the natural level of glutathione, neutralises harmful metabolites of drugs (mainly paracetamol), reduces the risk of nephropathy (disease of kidneys) as well as shows effectiveness in treating AIDS through inhibiting the activation of the protein NG-kB, which results in that HIV genes are not transcribed. It shows anti-inflammatory and antioxidant features, thanks to which it neutralises free radicals in inflamed or anoxic cells. Cysteine - why is it important and what are its functions? Cysteine is a proteinogenic, sulfur-contatining amino acid which is a component necessary for normal functioning of the organism. It contains the thiol group (-SH), thanks to which it is capable of creating disulfide bridges and thus, influencing many protein structures. It is created in the organism as a result of the reaction between methionine and serine. Through oxydation it is transformed into cystine, and through decarboxylation - to cysteamine. It is a taurine precursor and the most important component of glutathione (apart from glycine and glutamic acid), as its thiol group (-SH) is an active group in redox reactions (oxidation and reduction) where glutathione performs its main functions. As cysteamine, it is one of the procursors (apart from ATP and pantothenic acid) of coenzyme A (CoA), and its thiol group (-SH) is the active group of that coenzyme and it enables the binding of the acyl group, through which the acetyl-CoA is created. Coenzym A takes part, among other processes, in the biosynthesis of cholesterol and, in turn, steroid hormones, acetylcholine synthesis, catabolic reactions which lead to energy release (Krebs cycle) and in the process of neutralisation an removal of sulfonamide. Glutathione is the most important antioxidant and detoxicant present in every body cell. It is called the guardian of human health. It is a tripeptide which builds living cells, made of the amino acid residues of glutamic acid, ceysteine and glycine, and the most widespread intracellular thiol, that is the compound containing sulphur. It removes heavy metals, protects the liver, fights free radicals and supports the immune system, and its low level means that there is a medical condition in the organism. Paracetamol is a popular and widely used painkiller and anti-inflammatory agent. However, not many people realise how toxic it is. Used too often or in large doses, is leads to the gathering of its toxic metabolite - N-acetyl-p-benzoquinone imine (NAPQI) in the organism. The metabolite is commonly neutralised by glutathione but when the amount of it is too big, the natural reserves of glutathione are not enough to manage it. In that situation, there is a reaction between toxic metabolites and the crucial liver enzymes, which leads to damaging liver cells and, in turn, to acute liver failure. Administering NAC prevents that situation, and that is why preparations containing acetylcysteine are registered as medication used in paracetamol overdose treatment. It immediately restores the normal level of glutathione, which neutralises harmful metabolites. The above-described situation may also occur with toxic metabolites of different drugs, as well as different toxins, which makes NAC a perfect preparation protecting liver from many orally administered medications. Research has shown a beneficial effect of NAC on treating many psychiatric disorders: autism, Alzheimer's disease, bipolar affective disorder, depressive moods, obsesive-compulsive disorders, schizophrenia, particular forms of drug addiction, including cocaine and marijuana, as well as some forms of epilepsy. Moreover, it has been proven that people with autism have a reduced level of glutathione and cysteine. NAC probably shows its characteristics through a beneficial effect on the neurotrasmission of glutamate and dopamine, as well as through its potential to suppress oxidative stress and neutralise harmful toxins. One of academic studies has confirmed that NAC reduces the consequences of brain and nervous system damage in soldiers with traumatic experiences. In another study, NAC reached a high effectivity in traumatic brain and spinal cord injuries, as well as in injuries caused by brain hypoxia and ischemia. NAC reduces the loss of nerve cells and protects them from damage. It also prevents cognitive and neurological disorders connected with a traumatic event. 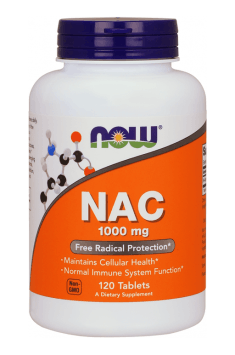 To sum up, Now Foods NAC is a dietary supplement mainly for those whose liver is exposed to damage through pharmacological medications which affect its functioning negatively. Thanks to its anti-virus and anti-bacterial characteristics, it is a very good supplement for people with weak immune system. 1 tablet 1-3 times a day. The phenomenal product with a wide range of health benefits. It increases organism efficiency and supports regeneration, making it an ideal supplement for physically active people. It regenerates of damaged liver cells and helps the body detoxification. For this reason, I would recommend it to athletes during and after the completion of cycle with the use of steroids and pro-hormones, as well as current smokers and abusing alcohol. What's interesting - NAC supplementation is often used as an aid in recovering from various addictions (nicotine, cocaine). We recommend taking 3 tablets a day, 3 times a day, at intervals of several hours. I suggest rather not take them at once - NAC raises glutathione levels (active guardian of human health) in a relatively short time, because the distribution of doses over time will maintain its optimal level in the body. NAC is a safe substance and can be taken continuously. This is not a stimulant to which the organism could get used to it and eventually develop resistance to its effects. Supplementation should be a regular part of taking care of your own health. Cellulose, Rice Flour, Stearic Acid (vegetable source), Silica and Vegetarian Coating. The product reduces unpleasant gastrointestinal ailments and supports the treatment of irritable bowel syndrome (IBS). Strong pre-workout. It increases stamina and endurance of muscles and decreases the feeling of fatigue.